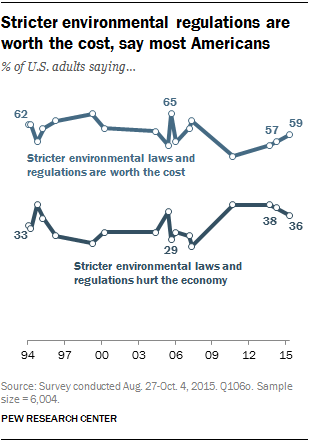 When it comes to potential trade-offs between the environment and the economy, most Americans say stricter environmental regulations are worth the cost, while fewer say stricter environmental regulations cost too many jobs and hurt the economy. But there are substantial differences in opinion about this issue from one state to the next that tell a different story than national surveys on the issue. Generally, public attitudes on environmental regulation, as well the environment generally, are strongly linked with politics. Democrats and liberals are much more likely to support stricter environmental regulations, while Republicans and conservatives are by comparison more likely to say such regulations cost too many jobs and hurt the economy. But these views can vary greatly by state. At one end of the spectrum, fully 71% of those who live in the District of Columbia, 70% of those in Vermont and 68% of those in Hawaii said stricter environmental regulations are worth the cost, according to a Pew Research Center survey conducted in summer of 2014. 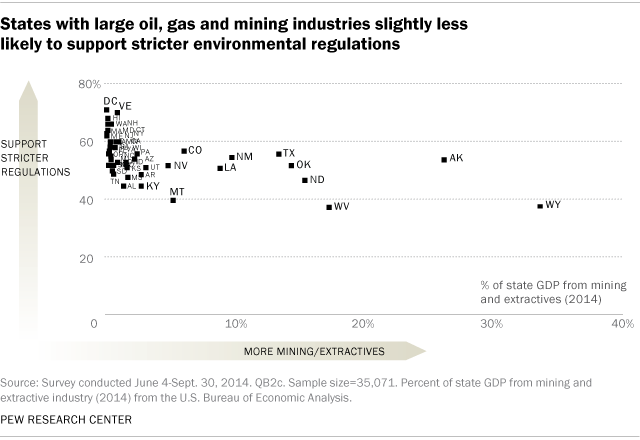 At the other end, just 38% in West Virginia and Wyoming, respectively, and four-in-ten in Montana said stricter environmental regulations are worth the cost. And those living in North Dakota, Kentucky and Alabama are closely divided over this issue. State governments play a key role in environmental regulatory policy. For example, California has stricter laws limiting power plants’ carbon dioxide emissions than many other states, such as Texas. Public opinion is likely one factor that influences such differences from state to state. 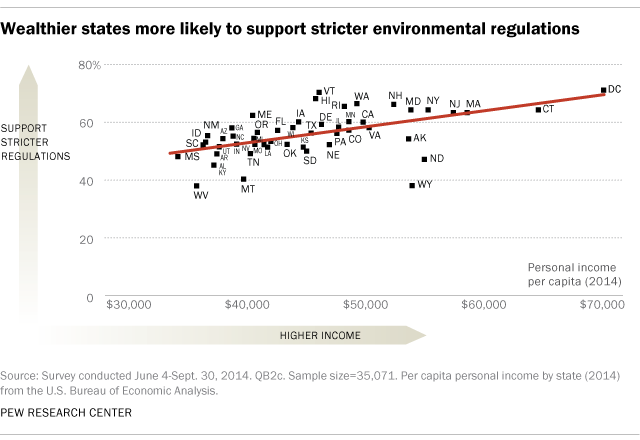 The political and economic contexts in which people live help explain differences in state-level support for stricter environmental regulations. 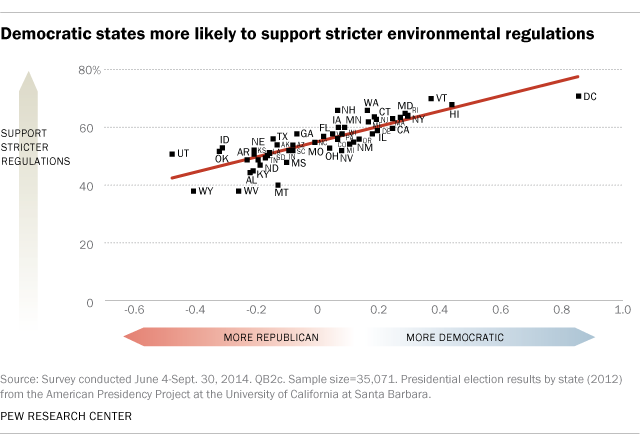 States that voted for Democratic candidate Barack Obama in the 2012 presidential election are more likely to say that stricter environmental regulations are worth the cost. For example, nearly seven-in-ten adults in Hawaii (68%) and Vermont (70%) hold this view, and both are states that backed Obama in the 2012 election by a wide margin. By contrast, those in states that voted for Republican candidate Mitt Romney in 2012 are more divided about the trade-off between the economy and environmental regulation. State economic conditions are another factor. People living in wealthier states where per capita incomes are higher, such as New Jersey, Massachusetts and Connecticut, tend to see environmental regulations as worth the cost. By comparison, those in poorer states such as Mississippi and Alabama are more inclined to see environmental regulations as costing too many jobs and hurting the economy. The linchpins of a state’s economy also can make a difference. A relatively low share of those living in states like Wyoming, Montana and West Virginia say that environmental regulations are worth the cost. All told, the extractive industry – including coal mining as well as oil and natural gas drilling – makes up 5% or more of the state gross domestic product in 10 states across the nation. Opinions differ widely across these 10 states but, on average, fewer in such states see environmental regulations as worth the cost.